It was my first hiking trip after Lasik eye surgery . At that time I felt a strong need to go to the mountains – it was over a month without any hiking trip! Every person who fell in love with mountains will understand this perfectly – one just needs to go, otherwise he/she will feel poorly – some important part will be missing in life... Anyway, hiking in the mountains with my eyesight fixed felt brilliant! I’m so happy I can see my beloved mountains without my bloody steamy glasses! That Saturday we went to Little Beskid (Beskid Mały). Little Beskid is not to be confused with Low Beskid (Beskid Niski). The latter mountain range lies in southeastern Poland and northeastern Slovakia, close to Bieszczady mountains. Little Beskid is located in the south of Poland, between Silesian and Żywiec range. As the name of the range suggests, the mounts there aren’t particularly high - the highest one is Czupel (933 metres). But, still, hiking there provides pleasant and rewarding feeling of climbing a mountain. We started our walk from Krzeszów (486 metres) – small and peaceful village close to Wadowice . I guess it’s worth to mention that in Wadowice one of the most famous and friendly popes was born – John Paul II . Being born close to the mountains, Polish pope was also nature admirer and liked climbing the peaks. As a result, there are many religious signs in Little Beskid. On our way up we saw many wayside shrines and crosses. 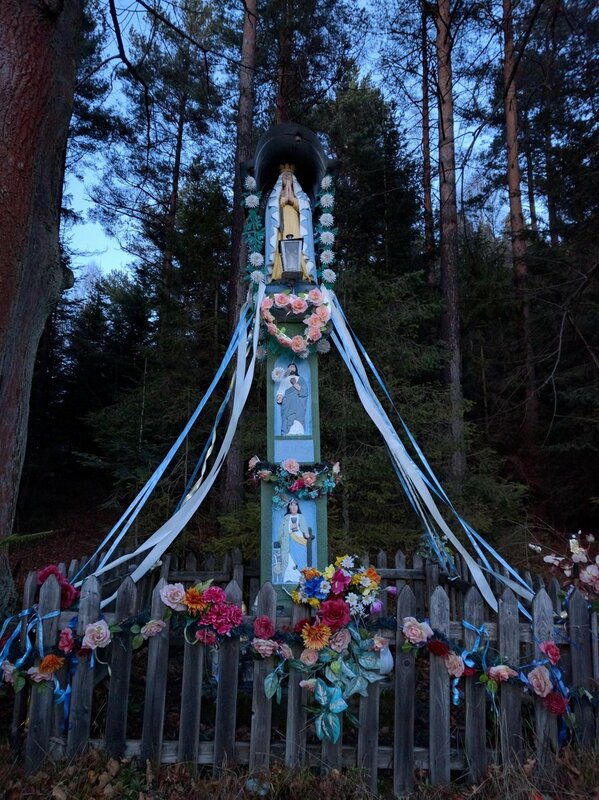 In general, you can find a lot of religious signs in Polish mountains but it’s Little Beskid that is especially influenced by the fact that Poles are religious and we had once a pope. We hiked along red trail. It was nice and easy walk, ideal for families with children. Getting to Leskowiec mountain hut (890 metres) took us about 2 hours. Funny thing – the mountain hut is located on John Paul II Groń but it’s called Leskowiec after the mount which is 15 minutes walk away. How come? Why Leskowiec mountain hut isn’t located on Leskowiec mount? I dug into some Internet sources and found out that when the hut was built the peak was called Leskowiec, so the building was named accordingly. However, before World War II, Austrian cartographers who created maps of Little Beskid made a mistake and named the mount Jaworzyna. Years later (in 1981) the mount was officially renamed to John Paul II Groń as it was one of the favourite hiking destinations of Polish pope. So, throughout the history, the peak changed its name a few times but mountain hut’s still called Leskowiec. The hut itself is rather small but there’s loads of tables and benches around the building which came in handy for us. It was December but there was hardly any snow and the temperature was rather agreeable. We had a break and went to nearby altar - few minutes away from Leskowiec mountain hut there’s a religious complex where masses take place. The chapel was built in 1995 to commemorate 75th birthday of John Paul II who used to hike a lot in this area. There’s also a great vantage point. Then, we hiked to Leskowiec mount (922 metres). It provides great view on Żywiecki Beskid range with majestic Babia mount (1725 metres). Obviously, on Leskowiec there’s a big cross. After a short while we started climbing down along yellow trail. Of course, it’s called “papal trail” 😉 We got to Targoszów village (495 metres) after about 2 hours. On our way back we met 3 beautiful does which, surprisingly, weren’t afraid of us and just walked by majestically. If they could talk they’d say “What are you staring at? I’m in charge here!”. In Targoszów we started hiking along green-yellow trail. Getting to our car, which we left in Krzeszów, took us about 40 minutes. As expected, we passed by even more wayside shrines and crosses. To sum up, this part of Little Beskid is great for one-day hikes , family trip included – it’s not very demanding but still offers nice views. It has also the most religious trails you can possibly find in Polish mountains. And you, have you ever hiked any "religious" trail?